Knitting is a great way to de-stress, explore your creativity (yes you are creative! ), meet new friends, and create long lasting accessories and garments for yourself. 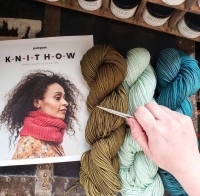 The publishers of Pom Pom magazine have created the 'Knit How' book, a cool and hip knitting book that goes through all of the basics and answers a lot of your questions. DM us for more info!